ORLANDO, Florida (CNN) -- He looks like President Barack Obama, speaks like him, and even gestures like him, but he is not exactly the president of the United States. 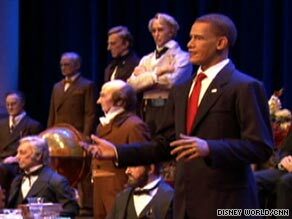 The President Obama audio-animatronic figure "speaks" at the Hall of Presidents exhibit at Disney World. This president is an audio-animatronic Obama surrounded by the 42 other U.S. presidents at Walt Disney World's newly revamped Hall of Presidents in Orlando, Florida. Disney gathered a team of what it calls "Imagineers," each trained in various disciplines such as artistry, design and engineering, to update the attraction that has been around since 1971. It's hard to believe the figures are not real people and, according to Disney officials, that's the goal. Disney calls the new President Obama figure "the most dynamic figure Disney has ever created." "We're very proud of the technological advances that allow this to make him come to life so realistically," Jacobson said. Imagineers traveled to the Washington, D.C., to record Obama's voice for the show. They also worked with White House staffers to make sure his wardrobe, hair and mannerisms were portrayed as accurately as possible. "He's very tailored and very well-dressed all the time so that's what we were trying to achieve, and I think we did," said Janice Jones, a costumer at Walt Disney World. Disney sculptor Valerie Edwards created the Obama figure's likeness. "Well, it's a great pressure of course to completely do an accurate job of somebody that's in the media so often," Edwards said. She used an array of pictures and video of the president to capture even the slightest facial expression. "I can watch the different speeches and I can watch his cadence as he speaks, I can watch his muscles as they move, I can see how his face changes as he speaks to see if there's any dominance in muscle," Edwards said. The retitled show is called "The Hall of Presidents: A Celebration of Liberty's Leaders," and it focuses on the bond between the president and the people. Presidential historian Doris Kearns Goodwin consulted on the project and said people who see the show should feel a greater sense of closeness to the presidents. "These presidents are human beings with their own need to withstand adversity, sometimes to conquer fear," Goodwin said. "Yet the other side of it is that mystery of leadership. The best ones are able to give confidence and hope to the American people themselves." The new exhibit also features speeches from George Washington and Abraham Lincoln. While the Hall of Presidents has been around for nearly 40 years, Disney officials said refreshing the attraction during this moment in history will make the exhibit remain relevant for new audiences. "This is a great chance to update the show and make it even more spectacular and technologically advanced then it ever has been," Jacobson said. The exhibit officially opens during July Fourth weekend.